Arlington, VA, October 28, 2014 – Today, PBS KIDS debuted full-length streaming video content and digital games from its newest upcoming media property,ODD SQUAD, giving kids a sneak peek at the series in advance of its November 26 premiere on PBS stations. Six full-length 11-minute “Case Files” from the series, as well as many additional clips that include profiles of the agents, agent training videos, recruitment videos and more, are now available for free on pbskids.org, the PBS KIDS Video App, and PBS KIDS on Roku, Apple TV, Chromecast and Amazon Fire. In addition, two games and parent resources are now available on the series’ website: pbskids.org/oddsquad. ODD SQUAD focuses on two young agents, Olive and Otto, who are part of Odd Squad, an agency whose mission is to save the day whenever something unusual happens in their town. A math concept is embedded in each of their cases, as Olive and Otto work together to problem-solve and set things right. Each episode of ODD SQUAD will consist of two 11-minute stories as well as interstitial content. ODD SQUAD, aimed at kids ages 5-8, premieres on Wednesday, November 26, 2014, on PBS KIDS with a special one-hour broadcast of two back-to-back episodes: “Zero Effect/Bad Luck Bears” and “Soundcheck/Double Trouble.” The series will air weekdays following its premiere on PBS stations (check local listings). ODD SQUAD is created by Tim McKeon (Foster's Home for Imaginary Friends, Adventure Time, The Electric Company) and Adam Peltzman (The Electric Company, The Backyardigans, Wallykazam!) and produced by Sinking Ship Entertainment and The Fred Rogers Company. ODD SQUAD is funded by the Corporation for Public Broadcasting (CPB) and the U.S. Department of Education through the CPB-PBS Ready To Learn Initiative, a program that supports the development of innovative educational television and digital media targeted to preschool and early elementary school children and their families. ODD SQUAD’s website offers a variety of engaging games, activities and videos for kids, as well as parent and caregiver resources. 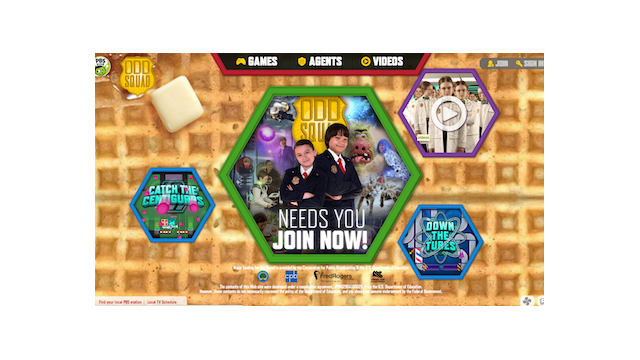 Children can sign up to become Odd Squad agents online and earn rewards as they play math games inspired by the series. Online games include “Down the Tubes,” where children can discover the vast network of tubes that serve as the main method of transportation for all Odd Squad agents. Players use their mathematical savvy to repair the tubes using pieces of different lengths and shapes. Also available on pbskids.org/oddsquad, “Catch the Centigurps”is a side-view arcade-style game in which players use gadgets to collect Centigurps (fuzzy creatures that are drawn to spherical objects) as they bounce wildly around the room. New content, including additional games and parent resources, will continually be added to the website following the November 26 premiere of ODD SQUAD. Bad Luck Bears: When odd things start happening to the Bears basketball team, Olive and Otto must set things straight before the big game. Soundcheck: Olive and Otto must figure out how and why things are disappearing around town when all Otto wants to do is listen to a song by his favorite band, Soundcheck. My Better Half: When symmetrical objects become vandalized, Olive and Otto must figure out why. The Confalones: Olive and Otto are called in to help when objects and, eventually, people start disappearing inside an Italian restaurant. Oscar and the Oscarbots: When several of Oscar’s Oscarbots (robots made in his own image) become lost in town, Olive and Otto must help him find them. Picture Day: Otto and Olive must figure out why people in town are becoming plaid and striped. PBS KIDS, the number-one educational media brand for kids, offers all children the opportunity to explore new ideas and new worlds through television, online, mobile and community-based programs. Kidscreen- and Webby-award winning pbskids.org provides engaging interactive content, including the PBS KIDS video player, now offering free streaming video accessible on computer- and mobile-device-based browsers. For more information on specific PBS KIDS content supporting literacy, science, math and more, visit pbs.org/pressroom, or follow PBS KIDS on Twitter and Facebook. Sinking Ship Entertainment is an award-winning production and interactive company that creates and produces groundbreaking kids TV and transmedia content. Since its founding in 2004, Sinking Ship has created and produced numerous children’s TV series and has been on the forefront of TV production and interactive media for kids. From being selected as one of the first partners of Amazon Studios with the upcoming series “Annedroids” to achieving Nick Jr.’s highest debut of all time with the action-packed series “Dino Dan,” Sinking Ship Entertainment brings dynamic content to audiences around the world with shows broadcast in more than 130 countries. Other series highlights include the award-winning “This is Daniel Cook,” “This is Emily Yeung” and “Are We There Yet? : World Adventure.” Find out more atwww.sinkingship.ca. The company was founded by Fred Rogers in 1971 as the non-profit producer of Mister Rogers’ Neighborhood for PBS. In the years that followed, it not only created hundreds of episodes of this much-loved program, but also extended Fred’s values and approach to other efforts in promoting children’s social, emotional and behavioral health and supporting parents, caregivers, teachers and other professionals in their work with children. The Fred Rogers Company continues to build on Fred’s legacy in innovative ways through a wide variety of media, and engaging new generations of children and families with his timeless wisdom. The company’s highly-rated, award-winning children’s series include Daniel Tiger’s Neighborhood and Peg + Cat. For more information, visit www.fredrogers.org. The Corporation for Public Broadcasting (CPB), a private, nonprofit corporation created by Congress in 1967, is the steward of the federal government’s investment in public broadcasting. It helps support the operations of more than 1,400 locally-owned and -operated public television and radio stations nationwide, and is the largest single source of funding for research, technology and program development for public radio, television and related online services. For more information, visit www.cpb.org.